There weren't many bugs until the last night on the lake. We found a great solution though. 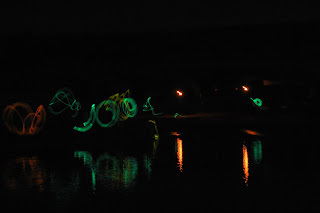 picture at left is a night shot of the two tiki torches accompanied by a light show of glow sticks. The most useful tool on the entire trip was a bag of clothespins, which we used to hang towels and other items on the lifelines. I'm not sure how we would have made it without them. They are permanent equipment on the boat now. On the last morning, we got up early to clean up the camping gear before the sun got too hot. A few tips for next year: don't bring tents, just sleep in the boat, and bury the coolers in the sand to make the ice last longer. ear, so we loaded heavy items in places where we could quickly remove them at the dock before trailering the boat. rsation before everyone had to shift again. g ride on the huge tube. As he pulled alongside, we debated about the best way to transfer passengers back and forth. Earlier we had tried rafting up, but the difference in freeboard, combined with the small waves, made the difficult. The kids found a good solution though - just yell 'Abandon Ship' and jump over the side! The older kids took the first ride on the tube, and really enjoyed it. But then came the challenge of getting the younger kids over. 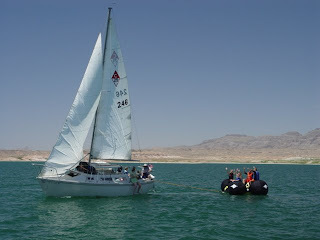 We sailed several circles around the powerboat as we debated the exchange of prisoners - er - passengers. Finally we decided to heave the tube's tow line from the powerboat to the sailboat, and we would just pull it in close, load the kids on, and then heav the line back. It was a great plan, really. Except that it took longer than we expected so we had to sail a couple of circles around the powerboat while towing the tube. It was like a giant sea anchor! When the kids got on, they all started laughing. We were still making about 5 knots towing the tube! The enjoyed the ride, and we made several circles around the powerboat just for the novelty of towing skiers behind a sailboat. At that point, my wife and I were alone on the sailboat. Wow. That never happens - life is so full of kids! 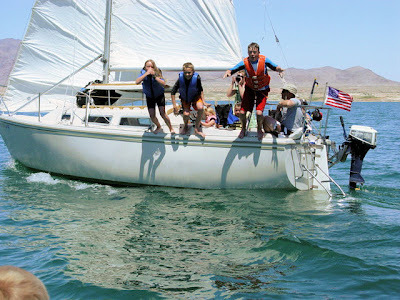 We enjoyed about 20 minutes of couple sailing, realizing that a Catalina 25 - though capable of sailing a crew of 8 - is really more roomy when the crew is only 2. We didn't want the trip to be over, and decided that this was going to be an annual excursion for our family. 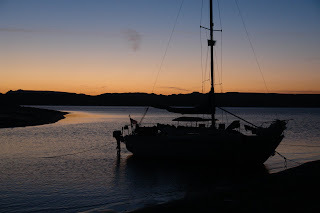 With a working outboard next year, we might even be able to extend the trip by a day or two because we could easily get in and out of the marina for more ice, and maybe even an afternoon trip to the air conditioned marina store for ice cream. He was only about a mile away, and nowhere near the marina, when we noticed his boat stop. There was quite a bit of commotion on board, and we realized he might be out of gas! So we set sail for his boat, and sure enough, out of gas! We debated for a few moments about what to do. Tow the powerboat in with the sailboat? Anchor the boat, and sail to the marina for gas? 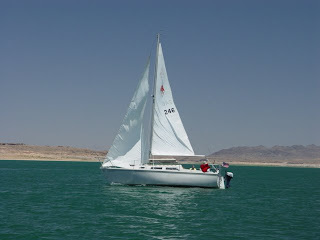 It was getting a little scary, because we were steadily being blown onto a lee shore, and in water too deep to anchor. Then we remembered that my outboard's gas can was still completely full. So we transfered the gas from the gas can to his boat, and headed for the marina. We only had 3 gallons of gas, which on a sailboat will get you through an entire month, but on a powerboat, not quite so long... 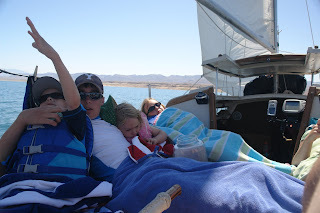 But the disaster was averted, and we began stowing sails and gear for trailering as we headed into the marina. Wow, that launch ramp was hot. Next year we'll plan to end and start the trip a little differently. I'd like more time to launch and retrieve the boat without everyone having to wait. Mayb we'll plan to launch early in the morning or later in the evening, and stay the night at the hotel near the marina. We headed back through Mesquite, where we decided to stop for the casino buffets and showers that night. What a fantastic trip. 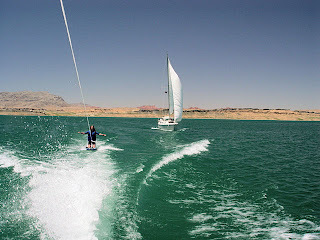 I'm sold - take me with you guys to Lake Mead next year!